The International Chamber of Shipping (ICS)/International Shipping Shipping Federation (ISF), a member of ISWAN, has launched a new web-based information resource to assist shipping companies to implement the International Labour Organization (ILO) Maritime Labour Convention (MLC). The ILO MLC entered into force worldwide in August although, in practice for many ships, full certification including the preparation of Documents of Maritime Labour Compliance on board individual vessels is not required until August next year. ICS, operating as the International Shipping Federation (ISF), negotiated the text of the MLC on behalf of maritime employers, with unions and governments, when the Convention was adopted in 2006. Natalie Shaw, Director of Employment Affairs, said: "This new ICS resource should help to answer many of the questions that employers still have with respect to MLC implementation and will hopefully serve as a kind of 'one stop shop', in combination with guidance we have already produced and that of individual flag states." 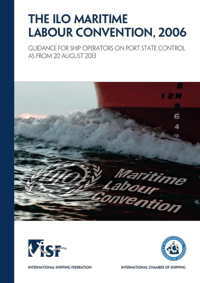 The new web resource contains responses to Frequently Asked Questions (FAQs), the differing ratification status of flag states, various guidance materials that have been produced by the ILO, as well as the existing free guidance on Port State Control which ICS published free of charge this summer. It also includes very recent material such as draft ILO guidance for the training of ship's cooks which was only developed last month. The new web area also provides information about the comprehensive ISF Guidelines on the Application of the ILO MLC, which were published last year, and the widely used ISF Watchkeeper software for maintaining individual seafarers' rest hours in accordance with MLC requirements. Ms Shaw remarked: "Although the ILO work hour record requirements have been around for some time, the entry into force of the MLC means they should now begin to bite and ships will need to produce very detailed records if they wish to avoid falling foul of port state control." and is readily accessible via the ICS homepage.